Visit https://www.beroeinc.com/ to learn more. Venture capitalist Marc Andreessen once remarked that “software is eating the world.” The import of Andreessen’s statement is that more businesses are being run on software and delivered as online services — from movies to taxis to national defense. Going forward, the Procurement function as a whole will be no exception to the rule — or so we are told. Achieve trusted adviser status among stakeholders. Deliver business value in a manner that helps bottom-line growth. Make informed decisions and excel at negotiation. Create advantages such that Procurement will be perceived as a business enabler (rather than a bottleneck). In an increasingly digital world where manual processes are transformed into bits and bytes, the challenge for Procurement Organizations is to stay relevant. Given this scenario, many companies struggle to decide whether a dedicated Procurement function is “good to have” or a “must have,” according to Rahul Devarakonda, Beroe Inc.’s head of product. “One of the key reasons why it makes the decision very hard is because of business stakeholders having to accept the fact that someone else would be guiding, monitoring and controlling their own budget with regards to external spending,” Devarakonda said. “Discrete spending, or being in a position to approve spending, represents power, authority and importance. This holds high value in the corporate world, where executives face immense resistance to letting someone else manage it,” he said. As they say, every problem has a solution, and the new catchphrase is “Procurement Digitalization,” which promises to offer an abundance of solutions to multiple problems. Now, the pressing question is: Can Procurement teams achieve the much-needed centrality if they jump onto the Digitalization bandwagon? Also, how can Procurement Organizations make an effective business case for such investment in technology when they are facing reductions in operating budgets averaging 0.3% in 2018, according to data published by the Hackett Group. While there are solutions in the market that envisage complete overhaul of processes and systems, with some features even sounding utopian, Procurement Organizations also face the prospect of an alternate approach, which uses a plug-and-play model to digitize certain processes that otherwise consume too much time and effort. However, what is Digitalization? What does it entail? The Hackett Group defines digital transformation as the process of transitioning aspects of a traditional business into a digital business, principally by applying technology to innovate. 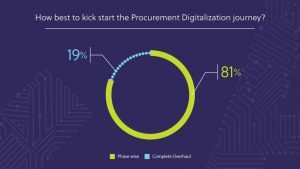 Nevertheless, there is no single definition of Procurement Digitalization, although the Procurement community is aware that some form of digitalization can bring in operational benefits. One approach is to use a plug-and-play model to digitalize only the chosen processes that otherwise consume too much time and effort. Will adopting digital technologies to selectively address process or people inefficiencies, instead of a complete overhaul or big bang digitalization still be labeled as digitalization? The industry experts with whom Beroe spoke seem to agree that selective technology interventions to address operational inefficiencies can also be termed digitalization, although as more of a means to an end (i.e., a good starting point toward the complete overhaul of systems and processes). Naturally, the approach to Digitalization would vary depending upon the maturity levels of each individual company within Procurement as well as their readiness to change. Digitalization requires a roadmap because few companies would be ready for a big bang approach. Adopting digital technologies for selective processes reduces risk and delivers return on investment as well as internal stakeholder satisfaction. Kai Nowosel, Accenture’s chief procurement officer, said that selective technological intervention to address process inefficiencies will most likely improve user satisfaction — with the Procurement brand — and free up money to invest in big bang investments such as data-driven decision-making and AI capabilities. He further explains that Digitalization enables a new value proposition for Procurement, which has three dimensions. “One is data-driven decision-making that goes beyond historical data and far beyond procurement data into business data correlation. Two is the AI capability to understand the data deeper and across more dimensions. Third is automation, as data points help machines to process known patterns. All in all, it moves Procurement to a business enablement function,” Nowosel said. 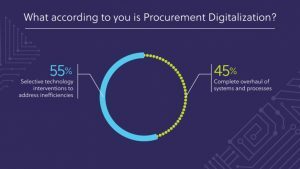 Beroe LiVE Poll: What is Procurement Digitalization? We ran a poll among users of Beroe LiVE, a community of thousands of Procurement decision makers, to understand how they define Procurement Digitalization. We surveyed those whose job titles fell under three categories: VP-Level, Director and C-Level. Of the respondents, 55% said that digitalization would mean selective technology interventions to address inefficiencies, while 45% said that digitalization amounts to a complete overhaul of systems and processes. Interestingly, the choices differed starkly across job roles. The responses from those at the VP-Level were split evenly between both choices. Nearly 60% of Directors said Digitalization would mean selective technology interventions to address inefficiencies. By contrast, 55% of C-Level respondents voted in favor of complete overhaul of systems and processes. Digitalization involves budget outlays. We asked our respondents about the percentage of total budget set aside for Digitalization in their organizations. 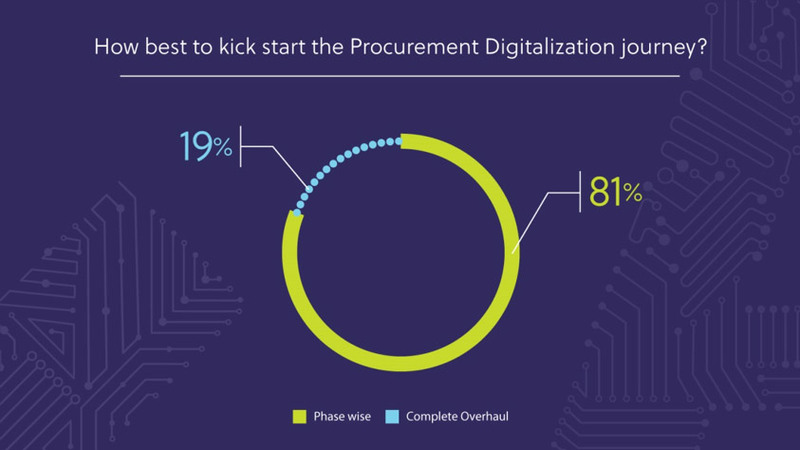 A little more than half the respondents said that less than 5% of the total budget is set aside for Procurement Digitalization, while only one-tenth said their organizations allocate more than 20% of the budget. C-Level respondents evenly voted for 5% to 10% and above 20%. None of them voted for 10% to 20%. It is quite clear that with limited budget outlays, Procurement teams will have to prioritize their tech investments to address inefficiencies. Big bang Digitalization may not be feasible for many Procurement Organizations right now. 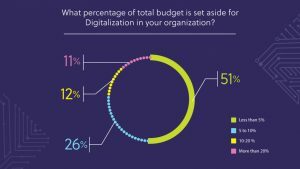 In fact, an overwhelming majority of the respondents said that the best way to kick-start a Digitalization program is in phases. Automates repeatable tasks to boost efficiency and reduce costs. Equips stakeholders across the business with real-time insights and analytics through artificial intelligence (AI) and easy-to-use online tools. Deploys new and smarter ways to infuse data models and enrich day-to-day operations and decision-making. Transforms buyer interactions with suppliers and other third parties by serving as a platform for new levels of collaboration. 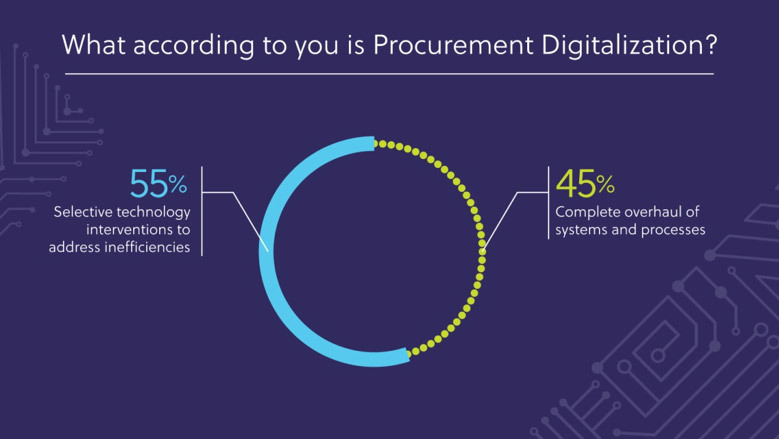 For its part, Deloitte says applying digital technologies to the Procurement function can enable strategic sourcing to become more predictive, transactional procurement to become more automated, supplier management to become more proactive and procurement operations to become more intelligent. Here are some examples of selective technological interventions that can bring about process efficiencies. Example 1: Catalog buying is becoming popular for high-volume services, which cuts down the time to procure a service. More spend can be brought under management as tools become smarter. Implementing catalog solutions has the potential to reduce maverick spend/spot buys and speed up the buying process. Also, improved “spend under management” helps achieve greater transparency. Emerging players generally provide SaaS-based solutions, which do not require major infrastructure setup. Moreover, they are adept at extensive customization and are open to adding extra service modules. This makes them a popular option for organizations that seek customization, along with lesser setup costs. Example 2: A Procurement Organization’s spend data usually reside in various databases and spreadsheets, often making it difficult to collate them into one coherent form for reporting purposes. Procurement Organizations can reap enormous benefits by bringing in much-needed visibility into spend patterns. 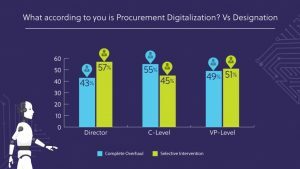 However, not all Procurement Organizations have invested in a comprehensive spend analysis tool, which makes it tough to single out an underperforming category or categories. There are several built-for-procurement spend analytics solutions available in the market. These offer intuitive user interfaces and graphical dashboards to help Procurement teams get the right insights at the right time. While selecting an appropriate spend-analysis solution, Procurement leaders should evaluate the software’s ability to automate the consolidation, cleansing and categorization of data. Example 3: The telecom spend of companies is increasing year-on-year. Furthermore, more than 80% of businesses overpay for their mobility services. Also, 65% of the telecom invoices contain errors while 85% of these invoice errors are in favor of the network carriers. Inappropriate contracts and plans, lack of proper policies for international roaming, underutilization of voice lines and mobile devices, premature device replacements and unnecessary data downloads are the main reasons for unbridled rise in telecom spend, which Procurement teams would like to curb. There is a way to fix this problem: Telecom Expense Management solutions can address the invoice errors and eliminate the problem of ever-rising phone bills. Procurement Digitalization is not a specific action but more a philosophy to utilize advances in technology to improve effectiveness. The implementation would depend greatly upon resources, severity of technology lags and opportunities for improvements. If the ROI for a large big bang implementation would be significant enough, a complete and swift overhaul may be beneficial. If the ROI would be smaller and less impactful, the continued improvement in processes could be budgeted and managed over time to make gradual improvements without significant investment in technology or disruption of operations. Sakthi Prasad is Beroe’s director of content.